I’m not a big fan of hierarchical keyword lists, although I gladly acknowledge I am unusual in believing they are more trouble than they’re worth. It’s not that I blame Adobe for introducing them, or that I think people are wrong to use them – more a case of saying be careful what you wish for. That doesn’t mean I don’t keep experimenting with adding some structure to my own flat keyword list, and I also encounter them in other people’s catalogues. By their nature, longer keyword lists are always unwieldy and they become even more awkward when there is a possibility that that the same keyword may exist in multiple hierarchy branches. So I’ve always been a fan of the Filter Keywords box at the top of the panel. You type in a few letters and the long list is filtered to keywords containing those characters. Sure, it could do with improvements and has a tendency to list too many irrelevant keywords. For instance, if you typed “Eng” with the intention of finding England, English and other variations on the country, you would see keywords like engineer, engineering, engine, Stonehenge, Engels etc. How big a problem is that? So you type “Engl” and filter out those false positives. However, one huge limitation of filtering a hierarchical keyword list was that you wouldn’t then see the children of the filtered keywords. 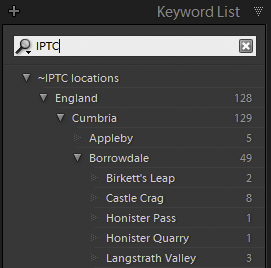 For example, here I’d typed “IPTC” into Lightroom 4 and I could see that “~IPTC Locations” had keywords below it, but I couldn’t see what they were without clearing the Keywords Filter. Keyword lists are inevitably long and difficult to manage, so it’s important to have a number of ways to visualize them. No single view can ever be right, and the previous lack of flexibility only succeeded in giving me another good reason for my avoiding hierarchical keyword lists and not gaining any advantages from them. Lightroom 5 has a new option to resolve this problem. You click the little arrow next to the magnifying glass and check “Show All Keywords Inside Matches”. This changes the behaviour of Filter Keywords so that all the matching keywords are displayed along with their children. It’s a small, subtle improvement that makes your keyword lists more manageable. The question for me is, will it make me change my mind about using hierarchical keyword lists? Not yet, but maybe. This is a huge help. I’ve been struggling with moving around the keyword hierarchy and this (quite hidden) checkbox is very useful. Thanks!